Last month during E3 2014, my team braved the afternoon sun and traffic to make our way to an off-site location to meet up with the folks from ArenaNet. Given the studio’s history of non-attendance at E3, it was kind of a big deal that they were there this year, regardless of our meeting location. However, having successfully launched Guild Wars 2 in China earlier this spring, ArenaNet was primed and ready to begin talking about its plans for Living World Season 2. Joining us were Living World game director Steven Waller and head of design Chris Whiteside, both of them eager to share what the Living World teams had been brewing up for the upcoming Season 2. To kick things off, we did a quick recap of the major events from Season 1. In particular, we focused on some of the key moments from the latter portion of those content updates when the concept of Living World really began to gestate into something that felt like a more cohesive experience. Your own mileage may vary, but for me that tipping point really began right around The Tower of Nightmares update even though many of the storyline seeds had been planted a few months prior. This sentiment was somewhat mirrored in the recent “Scarlet’s War” video (below) that provided players with the first real teasers of what might await us in Season 2. Immediately following a viewing of the above video, Steven shared some thoughts on where all of this might lead us. We ended on the beat of the destruction of Lion’s Arch and the killing of Scarlet, so that’s where we’re continuing on with Season 2. In that cinematic you just saw with the teeth at the end, that’s something that was seen by players inside the game, but they’re not quite sure what’s occurred yet. So now it’s a question of what the heck just happened, and what did Scarlet do? As Season 2 begins, ArenaNet isn’t skipping a beat and dives right into peeling back some of the layers surrounding the answers to those questions. It’s been a few months since the Battle for Lion’s Arch: Aftermath update dropped, so this has given us plenty of time to speculate. We’ll be exploring some of those possibilities and how they’ll impact Season 2 and beyond as Guild Wars 2 Week on Ten Ton Hammer continues. First, let’s take a look at the opening cinematic for the second season and some of the insights gained through our follow up discussions on what it all means with Steven and Chris. At this point in our discussion, Skyla, our resident social media guru and live stream specialist had a pretty strong reaction to the imagery of the crashed Zephyrite ship. As it turns out, the ship was heading out to an altogether different destination, and along the way they crashed. So our initial job as players will be to investigate what happened to the Zephyrites and what caused the crash. Familiar faces from the past year of Living World updates will continue this journey with you. So if you’re a fan of characters like Jory, Kas, Taimi, Rox, and Braham, you’re in luck as they’ll play an escalating role in the story as it unfolds. As part of the aftermath of the ship crashing, crystals have been scattered across the map so players will have the ability to use some of the familiar movement aspect skills to help traverse what is, by all accounts, a very vertical new landscape. Interestingly enough, you’ll also come across the Inquest who are also in the area doing some of the things they do best. In other words, making life difficult for players who will need to fight the Inquest to help protect some of the Zephyrites who are injured and in imminent danger. From here we were given a preview of the new map for Dry Top which sparked some fond memories of my travels through that same area in the original Guild Wars. 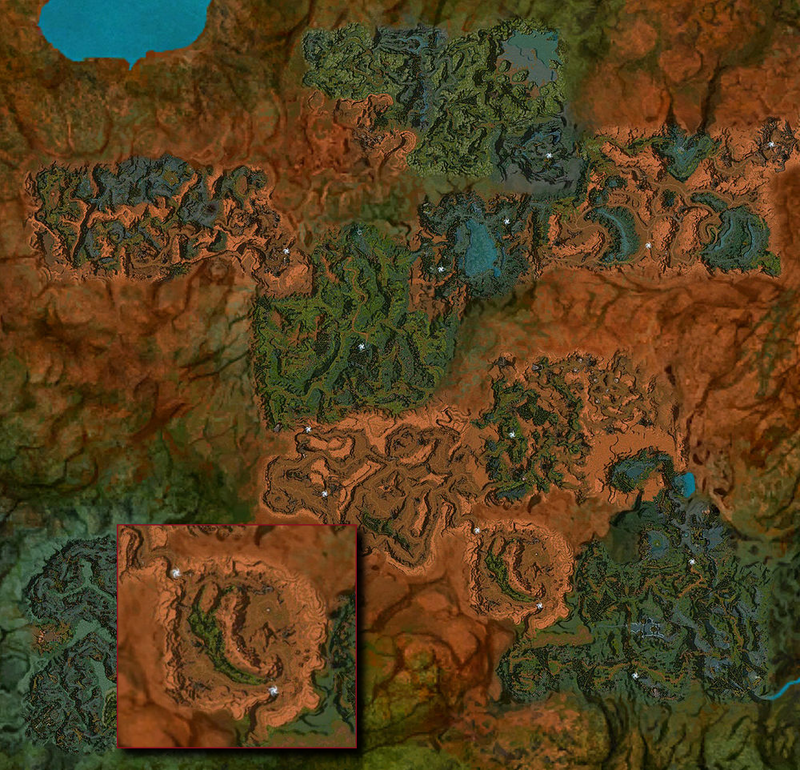 As a point of reference, Dry Top (shown below, inset into the full GW map of the Maguuma region) is a map that connects directly to Tangle Root in the original game, and stretches into a very arid patch of the Maguuma region heading west into Ettin's Back. So moving forward with Living World, one of the biggest changes will be that open world content is massively intertwined with the instanced storytelling. In terms of the story, players who really dug into the recent Festival content will also see some payoff as many question marks will be addressed as the story of the Zephyrites continues to unfold. Where is all of this leading, what are the inevitable results of Scarlet’s actions, and what new gameplay will players possibly encounter along the way? We’ll touch on each of these things later this week as we continue Guild Wars 2 Week on Ten Ton Hammer! In the meantime, don’t forget to check back tomorrow for our first impressions of the new content following our guided tour with Steven Waller this evening. For the Twitch fans out there, we’ll also be streaming the new content on Wednesday beginning at 9:00 AM PST on the official Ten Ton Hammer channel!